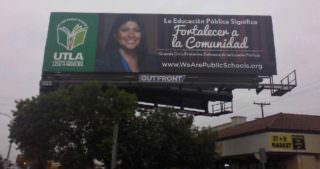 Look around at billboards, bus benches and online and you’re likely to spot a message from UTLA about students, teachers and parents telling their stories about their experience with the LA Unified school system. These positive stories about traditional district schools are part of an unprecedented media campaign launched this week by United Teachers Los Angeles, the second-largest teachers union in the country, which also plans coordinated demonstrations at schools this fall. “We are public school educators who are telling our stories,” said Betty Forrester, a UTLA and AFT vice president who has started her 43rd year at the district and whose daughter went to district schools. Myart-Cruz said that on Oct. 6 the district plans to join with 200 cities for a walk-in with the Alliance to Reclaim Our Schools. Teachers across the district plan to show support by walking into class together that day, and some schools will host speakers before the school day begins. A similar demonstration in February involved 40 U.S. cities and 170 LA Unified school campuses, according to UTLA, which has bolstered its spending power with a recent dues increase that boosted member dues by a third, bringing in an additional $8 million for the 35,000-member union. The NEA-affiliated California Teachers Association also launched a similar radio campaign this week.